These days everyone is dying to fly across the Atlantic for an epic Iceland elopement, but there are just so many gorgeous areas right here in our own backyards that are just as astounding. When Claire and Lloyd said they wanted waterfalls for their engagement shoot near Asheville I knew just where to take them. I knew of not one, but two waterfalls nearby that you can actually walk behind, but I hadn’t been to them since college nearly 6 years ago. I knew they were epic but we had no idea what we were in for! It’s been raining a lot over the last week or so and the falls were just raging, creating gorgeous mist and a giant softbox effect that made the most gorgeous light for photos. I was squealing like a child the whole time, I was so excited. These two are so joyful together, I just loved how Claire couldn’t stop laughing the whole shoot! 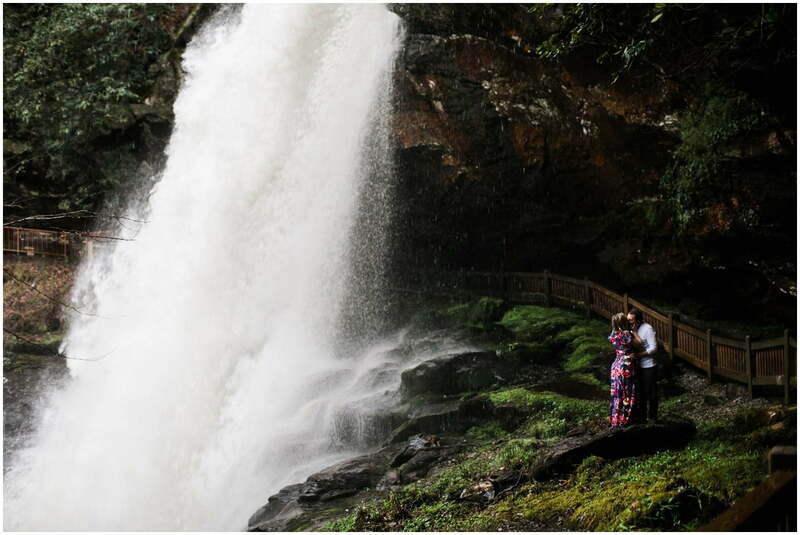 And any bride-to-be who’s willing to kick off her shoes and scramble around a waterfall with her soon-to-be husband is a win in my book. Scroll through and allow your jaw to drop as you check out this epic waterfall engagement session!